China rocks this blog again! 72 year old grandfather helped his granddaughter to launch her teen clothing line. He did all the styling and modeling and became a sensation. That’s a very cool grandpa and he’s got better poses than most models! Way to go. I must admit that he’s got great slim legs and they look very nice in pantyhose. The best part about his outfit is his confidence, no doubt. I personally like the photos without the wig much better because the concept is so unique that it makes me want to stare at it forever. With a wig it becomes more of a woman wanna be. In these photos you can see how Xiamen Airline hires air hostesses. 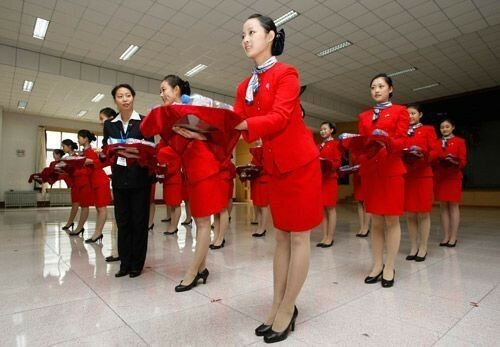 It is very common in China to have such a tough interview to choose flight attendants. Does this look like a beauty competition to you or like a test for the army? They check these girls to the teeth, literally! Also, in some cases flight attendants need to learn Kung Fu in order to keep their job. There is a whole entertainment show around it where girls compete and show off their talents like singing. Friends, I apoligize that I am not able to present more information, but most of information on this topic is in Chinese and I was not able to find anyone who speaks it and who would volunteer their time to run a Google search. Tried, 4 times. 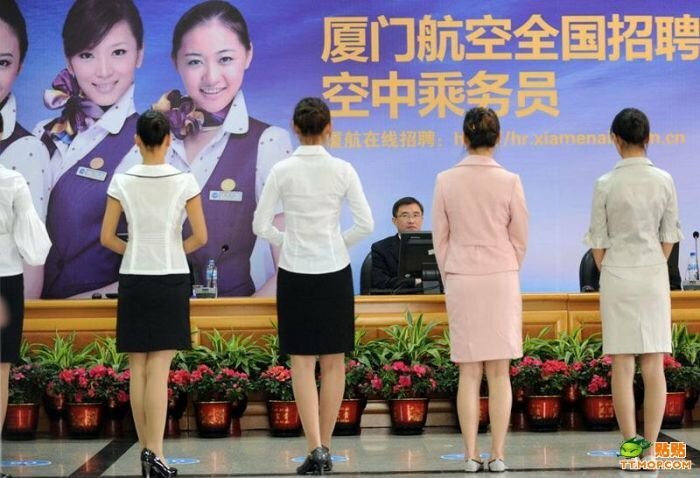 One of my distant acquaintances, who I’d rather not inform too much about my blog, helped to translate the title on the banner in these photos – Xiamen Airlines Hires Air Hostesses. At least that helped me a little bit with research. If for some reason you are able to add more to this, please drop me an e-mail. Thanks! Update: I managed to find a Chinese person to help me! She found what I was looking for immediately as soon as she typed in the keywords in Chinese. The sad part is that she wasn’t long around to translate. Youku channel has a lot of videos from that competition TV show! I hope to spend some more time working on it to put together a good story for you. There are some videos on Youtube from Hainan airlines too. I got these statistics online and I thought you may want to see that actually in some countries hosiery is on the rise. In 2011 hosiery in Canada saw healthy sales growth, with an increase of 3% in volume and 6% in current value terms to reach C$1.4 billion in total by the end of the year. This represented healthy growth compared with the value drop experienced during the recession, although in terms of volume growth remained positive through the recession and slow recovery. Hosiery sales increased in both volume and value terms compared to 2010, growing by 2% and 5% respectively in 2011. The famous British Wellington Boots led to the trend of wearing "Wellies with socks", which proved very popular in 2011 with sales soaring. Over-the-knee socks had a large part to play in A/W 2012 Fashion weeks, and were featured by many popular designers. Large woollen socks worn with short skirts and a large overcoat hit the runways. In 2011, hosiery volume sales remained on a declining trend while current value sales stabilised somewhat after consecutive years of marginal decline. This could be explained to a large extent by the efforts deployed by the main players to upgrade their offer through innovative and high-tech products. For instance, the leading socks player Groupe Kindy invested Р“СћРІР‚С™¬1.5 million in research and development in 2011 to expand its product portfolio and offer ground-breaking products. Companies making formal wear compulsory and the increasing number of students joining professional courses and colleges encouraged ongoing growth in demand for hosiery throughout 2011. Cotton remains the main material used in the manufacture of hosiery. 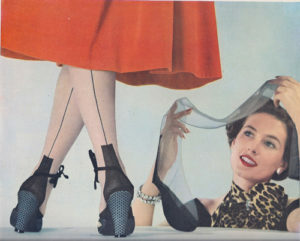 However, fabric is increasingly mixed with materials such as elastane, lycra and velvet, which increase the elasticity and comfort of hosiery considerably. The Hosiery in Spain report offers a comprehensive guide to the size and shape of the market at a national level. It provides the latest retail sales data 2006-2010 and analysis by distribution format allowing you to identify the sectors driving growth. It identifies the leading companies, leading brands, and offers strategic analysis of key factors influencing the market. Forecasts to 2015 illustrate how the market is set to change. Hosiery experienced 8% current value growth to reach HK$1,649 million in 2011. This represented a strong slowdown versus 2010 with the necessary nature of hosiery helping to support the continued positive performance of this category in 2011. Volume sales saw a small decline of less than 1% in 2011. The positive development of values sales has been achieved through the increase of unit prices. An increase in costs due to higher cotton prices and costs for energy induced manufacturers to raise prices. This price increase has been transferred to other customers. In 2010, hosiery sales registered 5% growth in volume terms and 16% growth in current value terms. The increase in demand is attributed to the growth in consumers’ disposable income, and hence, rising living standards. Consumers have greater requirements as their quality of life improves. Hosiery is no longer darned, and after the first hole appears is typically discarded. Modern businessmen in cities do care about what socks are visible under their trousers.